A Rainbow Birthday Cake for Ms Yangie! AngelKitten has been a regular helper, co-cook, co-conspirator and dreamer in my kitchen. It started out as an expression of interest on AngelKitten’s part to learn how to cook … but it has evolved into a friendship forged by food, and a sisterhood defined by how we balance each other. She is a perfectionist – specific and exacting, designing the most delicate and beautiful visual elements for my food. I am a little more … Aries in my approach. I cook with great passion, and my food is usually delicious – but I have been known to be a tad disorganised and messy. AngelKitten records everything I do (many of the recipes on this blog come from her handwritten notes), and when we brainstorm, she is the one who designs, sketches and keeps notes. 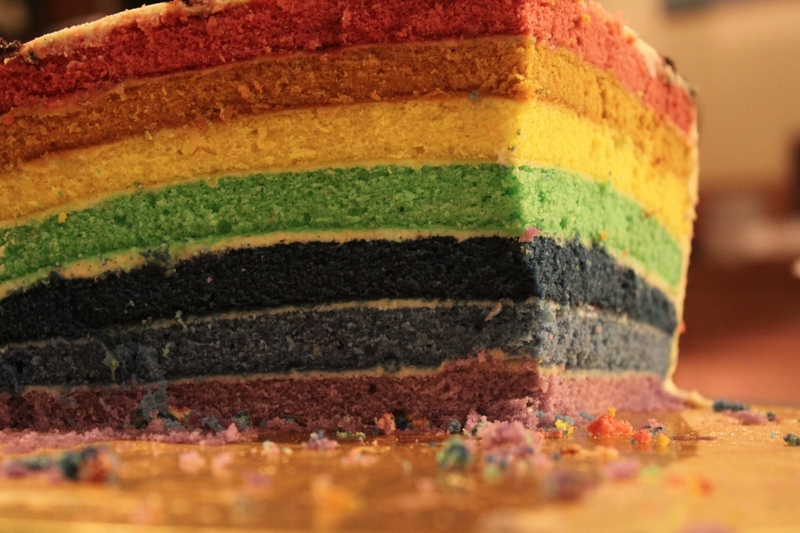 One of the cakes that AngelKitten has always wanted to make was a rainbow cake – thin layers of vanilla cake, coloured in the seven shades of the rainbow. We were considering it for our Princess Doll Cake, but ended up deciding it would be just too complex. For that cake, we stayed with the pink (!) theme, and divided the vanilla cake in half and flavoured it with fresh raspberry puree. But the idea for a rainbow cake always stayed with AngelKitten, and when her Mum’s birthday came around, she asked if we could make it. Ms Yangie's Birthday Rainbow Cake ... but where is the rainbow?! We adapted the recipe for the vanilla cake for this rainbow cake. You need a little more batter, so instead of doubling it, I made one and a half times as much (with a touch less baking powder). You also require loads of bowls because you will need to divide the batter into seven. We followed the colours of the rainbow as exactly as possible – purple, indigo, blue, green, yellow, orange and red. We used Wilton gel colours because we wanted to achieve a very bright rainbow, though I think, with a little care, you could easily create a more pastel, but just as beautiful rainbow with IndiaTree colours. You also need a lot of time. This cake takes seven bakings of 10 minutes each, and we only used two cake pans – so there was quite a bit of washing, cleaning, and cooling in between. We iced the cake with a vanilla bean cream cheese icing and AngelKitten made a chocolate ganache to pipe the decoration and birthday wishes. Yangie (AngelKitten’s Mum) had been wanting a rainbow on her cake, and when she received a pure white iced cake, kept asking, where is my rainbow? When she cut into the cake, and found this gorgeous rainbow, she was thrilled. 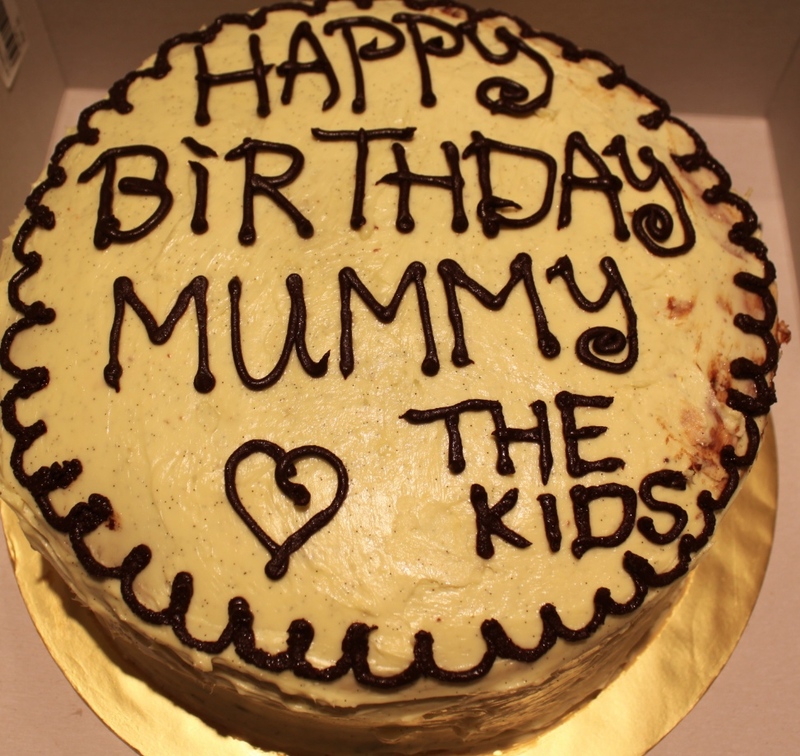 And I was delighted with being able to help AngelKitten create such a wonderful gift for her beloved Mum. Ahhh there it is! 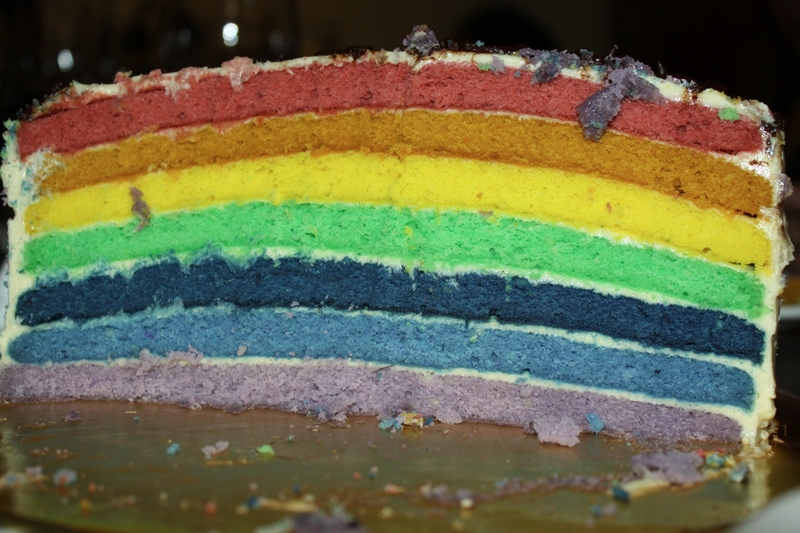 Rainbow Cake reveals itself! Preheat your oven to 165C (325F) and line two 9 inch cake pans with parchment paper. Spray the cake tins with non stick spray or use some softened butter. Set aside. Have seven bowls at the ready, along with gel or liquid food colour, and toothpicks. In a small bowl, sift together the flour, baking powder and salt, and set aside. In an electric stand mixer, cream together the butter and sugar until light and fluffy. Add the eggs one at a time, and then add the vanilla. You should have a creamy batter, but dont worry if it looks a bit curdled – it does that sometimes! Fold in (dont beat in) the flour mixture, alternating with the milk. Divide the batter evenly into the seven bowls. Begin dying the batter, starting with the violet/purple hue. As soon as it is dyed to your liking (and remember it does get a little darker in the oven), pour the batter into a prepared baking tin, and smooth with a spatula. The layer will be very thin. Bake for ten minutes, or until a toothpick inserted into the cake comes out clean, and it springs back lightly when pressed. Remove the layer from the oven, cool on a cake rack for about ten minutes, and then remove from cake tin by turning onto cake rack. Keep the parchment paper on the bottom of the cake as it cools. Repeat with the remaining six layers, prepping your pans as you go. When the first layers have cooled sufficiently, begin to ice the cake (you will be icing and baking all at the same time! Multitasking is fun!). Centre the first layer of cake on a cake plate. Use the parchment paper to help you move the cake layer around – lift the layer into your hands by turning the cake rack over, and shift the layer over to the cake plate by carrying it on the paper. Use the first of your seven bowls of frosting, and frost the top of the cake, and the sides lightly. Repeat with the remaining layers, using the parchment paper to help you centre the cake layers on top of each other. Once you have iced all the layers, frost a thin layer of icing along the top and sides. Place in the fridge for ten minutes (this is called the crumb icing – and helps you achieve a smooth final layer of icing), and then finally ice a thicker layer of vanilla cream cheese frosting over everything. Serve to the delight of your family and friends! In an electric stand mixer, beat together the butter and cream cheese until light and fluffy. Make sure the two are completely combined and no lumps or bumps remain – this may take up to five minutes. Remove the bowl, and sift the icing sugar over the butter-cream cheese mixture. Beat again until fully incorporated, adding the vanilla to taste as you go. Divide the frosting into seven bowls (we reused the batter bowls) and ice the rainbow cake as above.